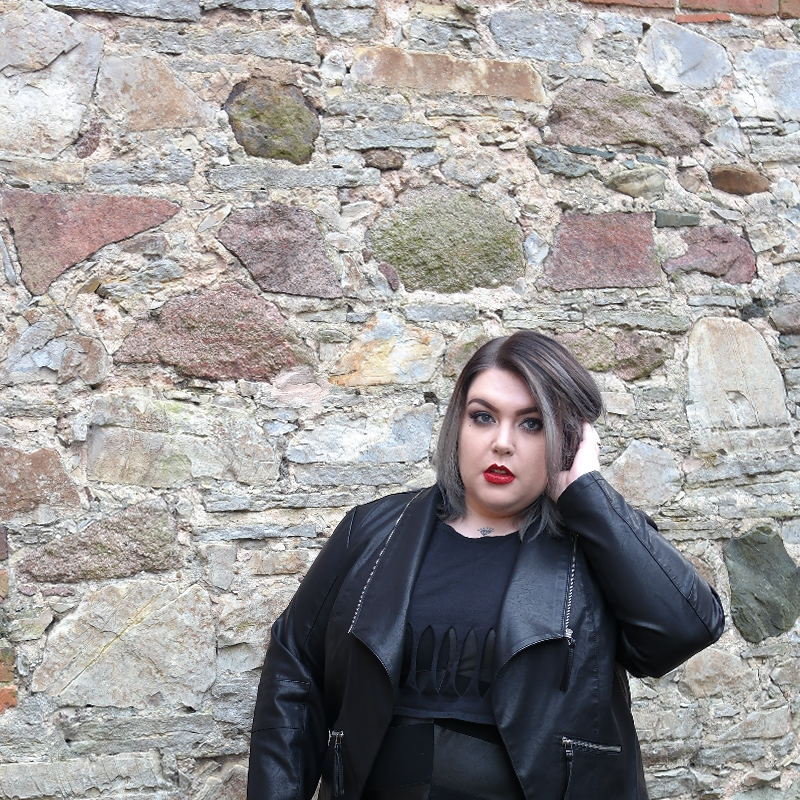 SCANDI GOTH CHIC WITH NAVABI - Sugar, Darling? I was a teenage goth. I then went punk. I then went pin up. I then just decided to wear whatever the hell I want which is how I live my life to this day, but over the last year or so a more 'refined' goth influenced style has crept its way into my aesthetic. Today I have chosen two pieces that I think exemplify simple Scandi-goth chic and styled them up two ways, creating two different outfits that I love to death and probably wear far too regularly! It was in the peak of my teenage goth phase when I first went to Copenhagen to visit my Danish relatives and to this day I have never gotten over the awe I felt when walking through the city and seeing the most effortlessly style I have ever come across. It was minimal, it was modern, it was edgy yet classic. It affected me deeply and I have always had a longing to dress in such a way (with my own twist of course) but up until I found Navabi I have never been able to find similar pieces in my size. I actually first found them a few years ago when searching for pieces by a Danish brand called Zizzi who I had found in TK Maxx of all places. 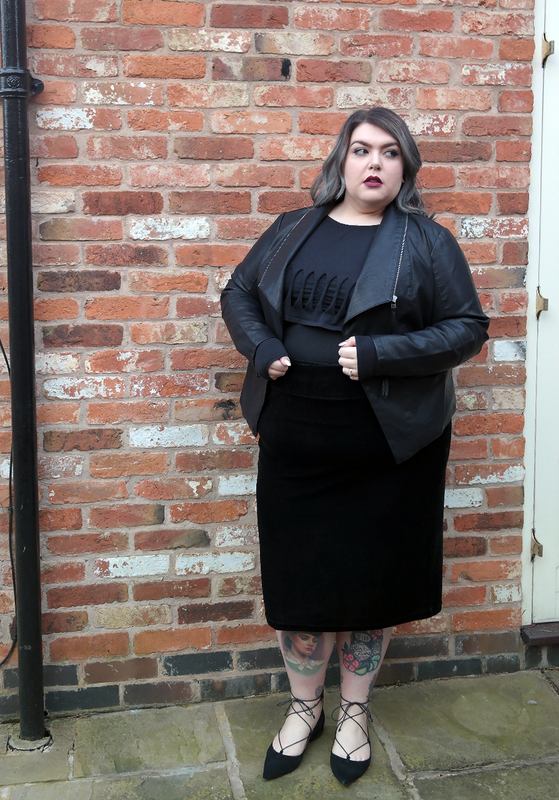 Navabi seemed to be the only place I could find their clothes that would ship to the UK and after some more in depth browsing I fell in love with their product ranges and the unusual pieces it offered me. Years later I am still in love with Navabi, still in love with Scandi fashion and still in love with Zizzi. This Zip Collar Faux Leather Biker Jacket (£69.99*) is a prime example of their simple but design conscious style and how affordable but great quality most of their pieces are. The faux leater of this jacket is butter soft and so realistic with a grain that imitates real leather to a t. The style is seemingly simple at first but when you look closer at the zip edged collar, the pointed shape to the bottom front of the body and the incredible panelling to the arms and back it is hard to believe that this was only seventy quid. The other key piece that I chose was by a new to me Dutch brand called Boris and their Oversized Cut Out Detail Top (£39.99*). I was a little unsure of this when I ordered it as it says its single size fits a 16-24 but I shouldn't have worried as the super oversized body and fitted yet stretchy arms do indeed fit my size 22/24 upper body perfectly. The cotton elastane blend it is made from is lovely and soft and delicate against your skin and sort of moulds and hangs in the perfect way to fit the style. My first look teamed these pieces with a velvet style skirt, a simple black fitted cami and my favourite lace up flats. These are all older pieces that have been in my wardrobe for at least a few months and so this is a great example of how a key piece can transform your existing clothes into something new and exciting. I absolutely adore the mix of textures with this look, I think this is the key to creating the successful all black outfit - mix the lengths, fabrics, and finishes to make it more three dimensional and it turns into something stylish and beautiful. The second look is a little more casual, taking some classic black skinny jeans and again adding a new texture with a PU and jersey panelled tee from Studio, another Danish brand. This is actually another old TK Maxx find but it just so happens that Navabi also stock Studio and let me tell you they have some stunning pieces available right now! Black suede effect flats and a slick of red lippy finished this look off perfectly and I left my hair unstyled to add to the casual feel. So what do you think? Is this a look that you would try?